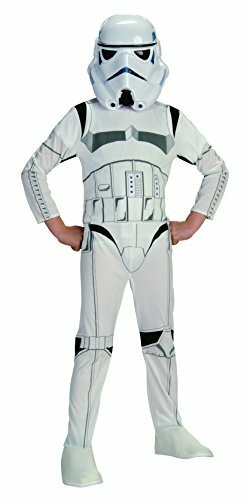 Officially licensed classic Star Wars Storm trooper child costume includes jumpsuit and mask. Rubies' Costume Company has been bringing costumes and accessories to the world since 1950. As the world's leader, we take seriously the mission to make dressing up fun. Mascots, rental quality costumes, masks, wigs, accessories, shoes and every significant licensed costume you want to wear can be found under the Rubies' brand. Still family owned and still family focused, Rubies' brings you fun for every season: Halloween, Christmas, Mardi Gras, Easter and all in-between.